Our communication line with EA Manchester seemed to break down at this point. We requested cheat codes to help with testing, since without them we had to play the game extensively to get enough money to buy the more expensive ships and weapons in order to test them. EA Manchester told us no such codes existed. We knew this almost certainly wasn't true, but if they wouldn't tell us, what could we do? While we can't be sure that this report is authentic, it's certainly worth a read. Everything2 also has nodes on Privateer, Chris Roberts and Wing Commander IV. We had a short period of downtime yesterday so routine server maintenance could be performed. Our Chat Zone remained offline a little longer while we worked out a few minor configuration issues. Everything has been up and running for some time now, so post away! The FiringSquad takes a look back on the games that made PC gaming great. Part two of this feature has a sizeable portion devoted to the Wing Commander series. I spent hours turning into weeks turning into months immersing myself in the Wing Commander universe. The fighting was certainly a blast, but somehow the fact that what I did had a tangible impact on the outcome of the game was very cool. I came to care about the other characters in the game, which has to be a testament to how strong the Wing Commander story was. Read all about it here. Thanks to GoBuisac Prime. HTL continues with part nine of the Tiger Hunt series, "Cloak and Dagger." As you saw in the last chapter, the Nephilium super carriers were short on fighter support because those fighters were hunting the Border Worlders, allowing the Confed ships to attack the carriers more easily. We now switch back to the Border Worlds pilots and crews who've got the unenviable job of keeping all those fighters busy. This chapter is written by yours truly, so please send any and all comments back to me. HellcatV has been busy developing a Privateer-style game using the VegaStrike engine. A pretty GTK save interface will let the players enjoy multiple save games and easy access to splitscreen multiplayer missions (in the multiplayer folder). A comprehensive tutorial leads you through making a few credits in detail, and leaves you fit with afterburners to explore the rest of the system, and eventually (with the purchase of a jump drive) the entire galaxy! Tell me your comments! I really hope you enjoy this release...it's been a major improvement and I urge you to try out as much stuff as you can, and e-mail me with any suggestions or questions! You can download the current version here. Looks pretty nifty. They have a player tutorial online as well. HTL continues with "Wins And Losses", as the battle in the Loki system rages on. As you saw in the last chapter, the TCS Valley Forge had gone down fighting, and taken an enemy dreadnaught with her. In the meantime, the light carrier TCS Endeavour confronts an enemy super-carrier. This chapter is written by Shaun "Iceman" Rashid, so please send any and all comments to him at velacia@rogers.com. GameSpot just recently listed a poll that asks which classic game series should be revived. Among the numerous candidates, Wing Commander is currently in the lead! There are other good games series with a lot of votes as well however. Even though they apparently aren't aware of WCP GBA and other things, it's nice to get a major news site's attention. Which classic series should be revived? Wing Commander of course! Head over to GameSpot and let everyone know. 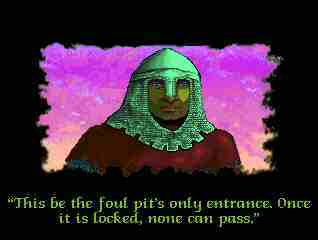 If you're busy like me, you may have browsed the Raylight page after reading up on WCP GBA. But did you watch the Blue Roses demo movies? We've talked about the new Blue Roses engine a lot. 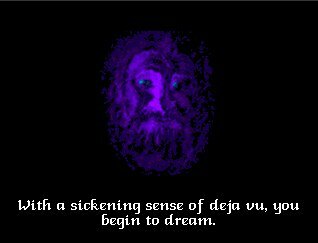 If you've been out of the loop, it's the amazing new 3D engine that will be used to port Prophecy to the Game Boy Advance. Yeah, we've read about thousands of polygons, rich textures and wonderful particle effects, but seeing these movies in action recently really impressed me. You can find Raylight's four demo movies here. I was amazed by how well the "Resident Evil" style guy stumbled in 3D and the flight sim movie just floored me. If you look closely, the little turret on the helicopter tracks the larger airplane as they move together. They're small movies that are well worth a look. Are you the only one in your office who doesn't think 'Kilrantium' is a really dumb name for an element? Are you mad because your significant other doesn't appreciate how important finding out that the Hhriss uses advanced armor plating is? Then you'd better make plans to go to DragonCon 2002, where you can hang out with the CIC team and a whole mess of other Wing Commander fans. We did D*C last year and had a heck of a lot of fun... and it promises to be bigger and better this year (more idiots in flight suits than ever!). The convention, the largest in the US, is held in Atlanta the weekend of August 30th to September 2nd. Learn more about it here and then contact us so we can plan all sorts of cool Wing Commander stuff! Sure, you know everything about the original Wing Commander... or do you? For the next several days we'll be introducing you to ports of Wing Commander you may never have known existed! 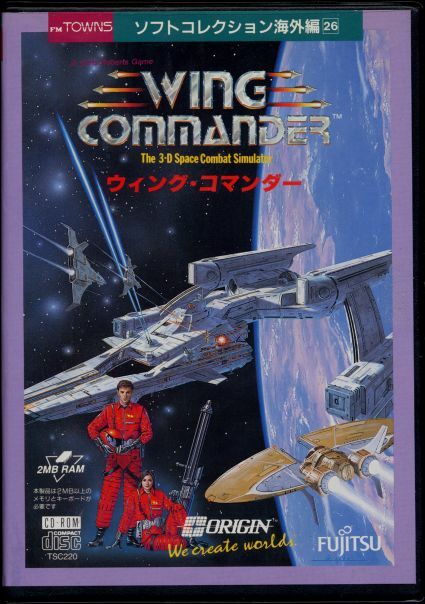 First up, Wing Commander (1) for the FM Towns. The FM Towns was a Japanese computer produced by Fujitsu throughout the first half of the 90s. The system is best known for the high number of X-rated anime games produced for it... but it was also one of the first personal computers to feature a CD-ROM drive. As such, it had some amazing ports of popular early-90s games, including several Ultimas, several LucasArts adventures and... Wing Commander. So what's so special about this edition? Partial speech: all the in-flight comms are spoken (in Japanese). 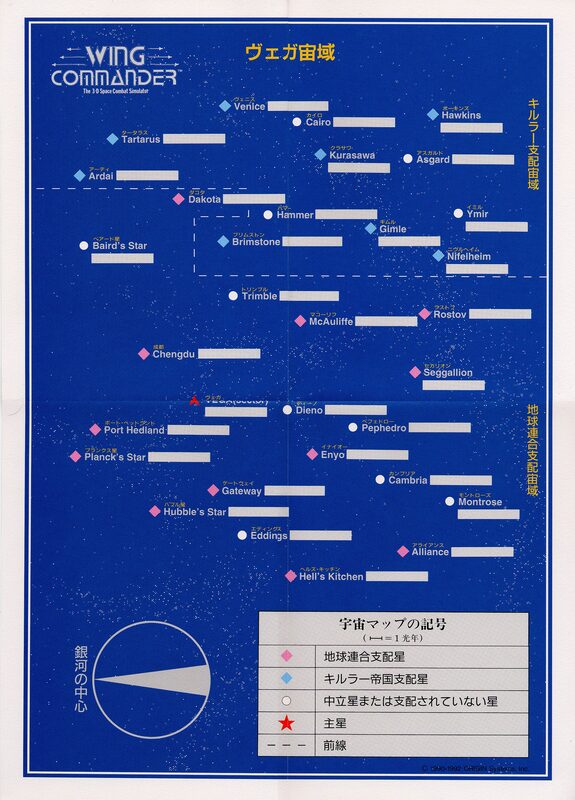 The original Universe Map: a nifty fold-out plastic road-map of the Vega Sector is included. Soundtrack: The game disc doubles as a music CD, with 40-odd high quality tracks that will play in a normal CD player. Cool new box art: Confed fighters attack a Fralthi... and Blair's flight suit looks eerily like those that later appeared in the movie. 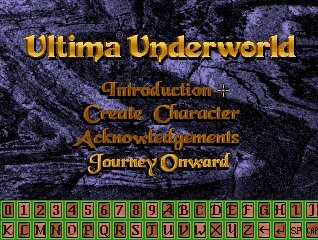 In all the excitement of Prophecy GBA we missed another relevant title demo'd at the E3... Ultima Underworld for the PocketPC! 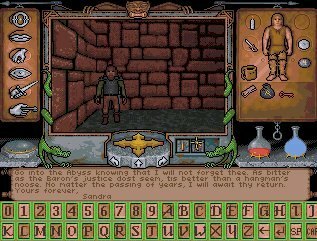 A company called ZIOSoft has released this Origin classic for the PDA... now you can play Ultima on the boat, at the pool or wherever fun is had. More importantly, it represents even more of a renewed interest in Origin's classic lineup of games... It's like 1990, only smaller! HTL continues with the last chapter of the last part of the "Further Down The Spiral" saga. As you saw in the last chapter, the Captain had managed to regain control of the Valley Forge from his treacherous XO, in the process revealing that both were part of a group that had planned to continue the work of the Project. Captain Vandermann rebelled against the needless sacrifice of his crew, but the situation may be too far gone to be salvaged. This chapter picks up from there, and is jointly written by all the Valley Forge writers. Please send any and all comments to them.